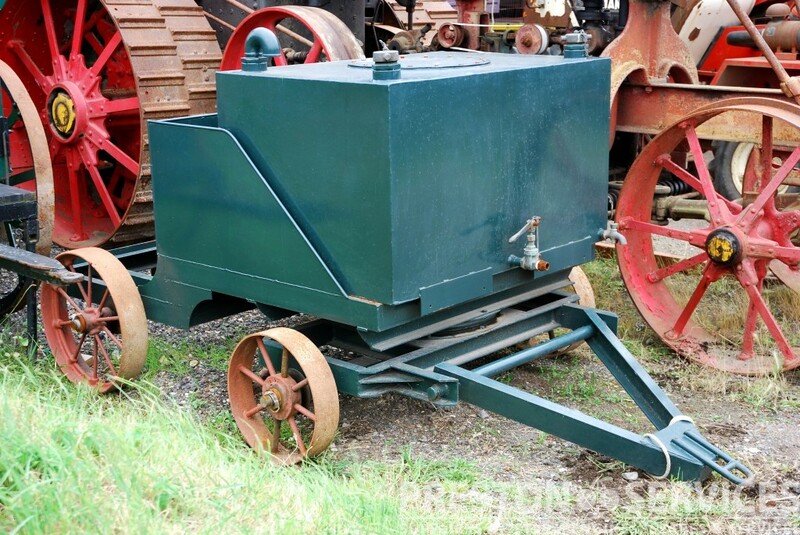 A heavily constructed steam engine tender to haul water, coal and other supplies. 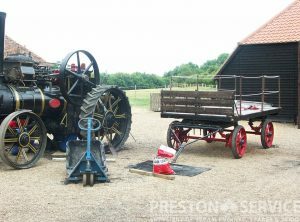 Heavy steel chassis with turntable steering on spoked wheels, and with A-frame. 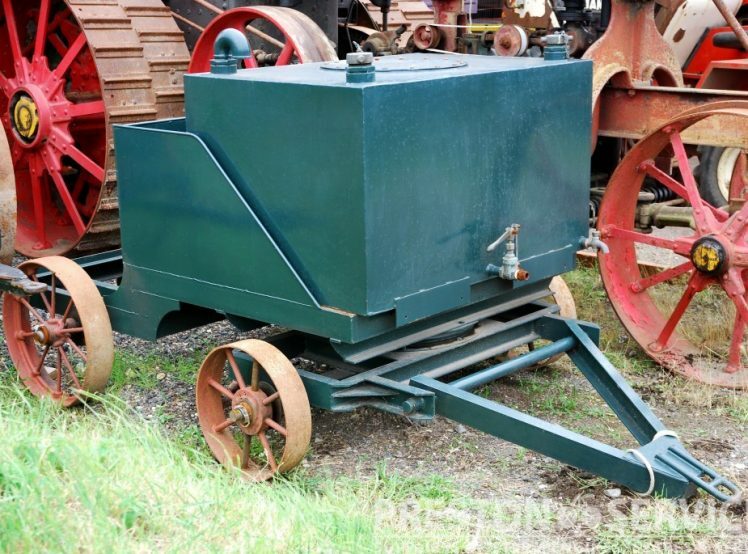 Large Water tank with hose connections and tap. Approx. 5′ 8″ wide x 7 Ft long. Tank approx. 52″ x 36″ x 30″. 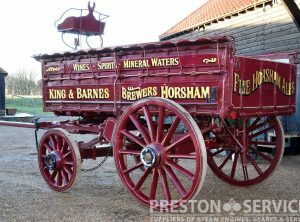 This impressive heavy haulage draw-bar trailer is believed made by Dyson & Co, Liverpool c1930. 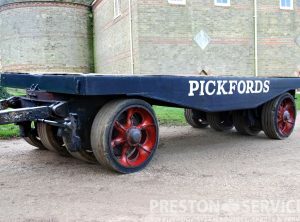 8 heavy cast wheels with solid tyres, turntable steering, A-frame tow-bar and steel bed. 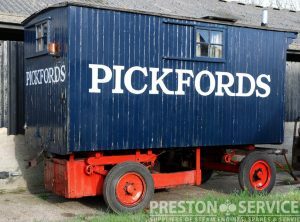 Used by the well known Manchester heavy haulage companies, including Pickfords. 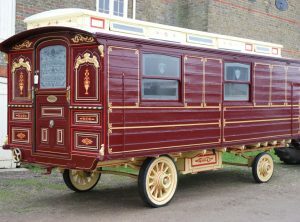 This crew van was reputedly built for road steam engine use c1925. 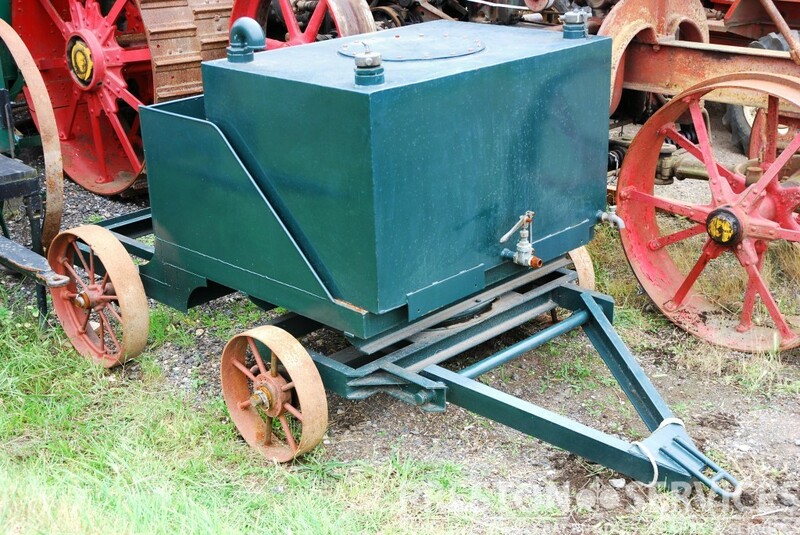 Belly boxes for stowage of towing tackle and equipment. 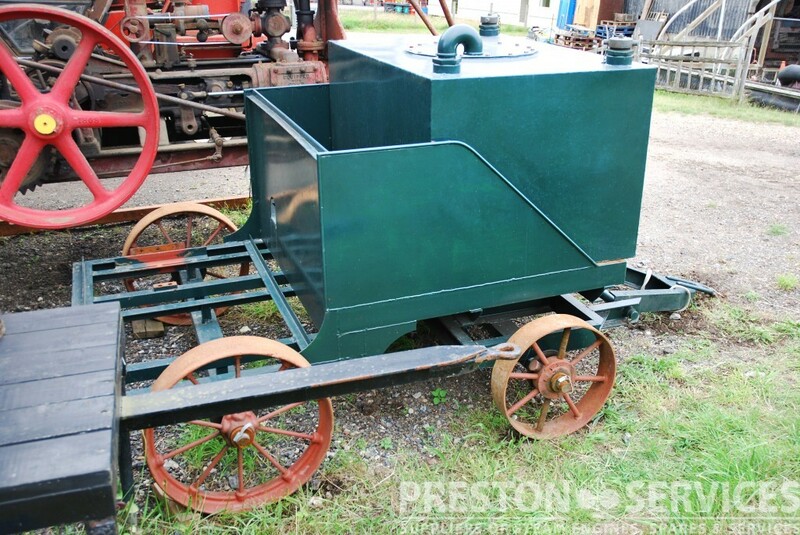 Fitted with pneumatic tyres for road towage. 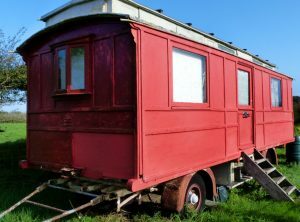 No.98 by Bomford & Evershed, Evesham. 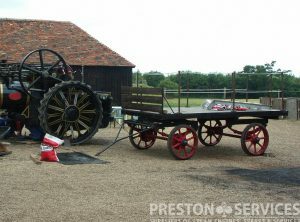 A very attractive multi berth traction engine living van. 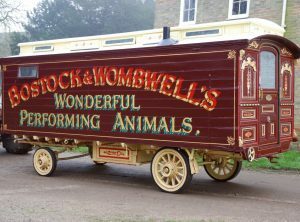 On solid rubber tyres with belly boxes. 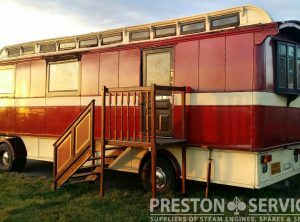 Highly original, restored inside and out and for sale in good condition, ready to use. 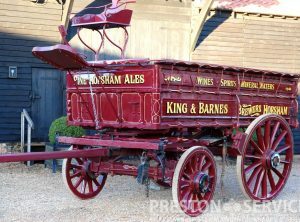 Ex King & Barnes Brewery, Horsham, Sussex. 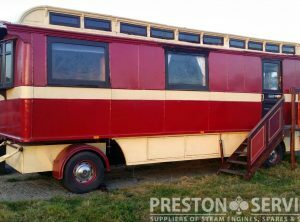 Available in very nice condition, superbly restored. 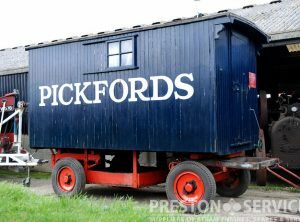 An attractive 4 wheel draw-bar trailer with heavy cast wheels and solid rubber tyres, flatbed body is fitted with upright stanchions for carry coal and other supplies. 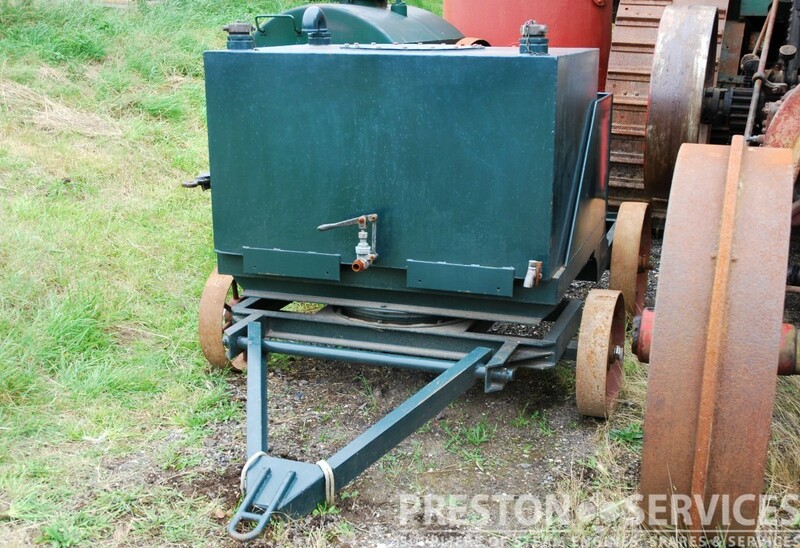 In reasonable condition and great for roading. 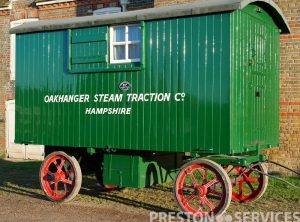 A nice, usable 1920's period van. 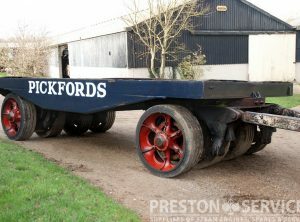 With Mollycroft roof, belly boxes on steel chassis and pneumatic tyres in reasonable condition. 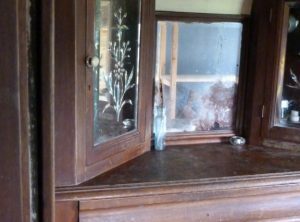 fitted mahogany period interior. 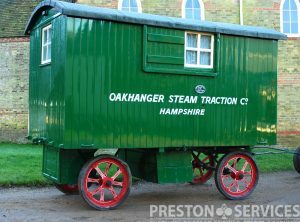 For sale in reasonable condition.